Cats are natural carnivores so eating meat is biologically essential for their survival. However, for domesticated cats, the ingredients in most commercial cat foods do not meet their natural nutritional needs. 1. Dehydration- In the wild, cats hunt and consume prey that contains approximately 70% water. They rely on getting most of their water from their food. 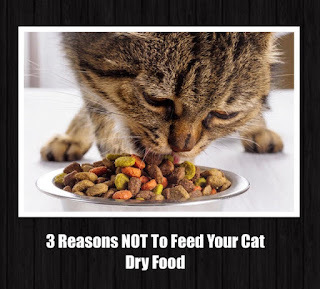 Dry food only contains about 10% water and since cats tend to be "water avoiders" this could lead to dehydration. Dehydration and low moisture diets have been linked to FLUTD (Feline Lower Urinary Tract Disease) and other urinary problems such as crystals and chronic infections. Senior cats are prone to dehydration and can also develop Kidney Disease If your cat does develop kidney disease, it's essential to feed a high moisture diet and use a few natural supplements to support their kidneys. Renelix - Renelix is a highly effective kidney detoxification natural remedy that helps the kidneys excrete toxins from the kidneys and urinary tract. Kidney Health Protein Support Formula -- Breaks down protein and improves metabolism of protein taking the workload off the kidneys. Just sprinkle on your pet's food. 2. Obesity- Cats are carnivores yet most dry kibbles list starchy carbohydrates as one of the first ingredients. Carbohydrates spike insulin, increasing hunger and raising sugar levels. 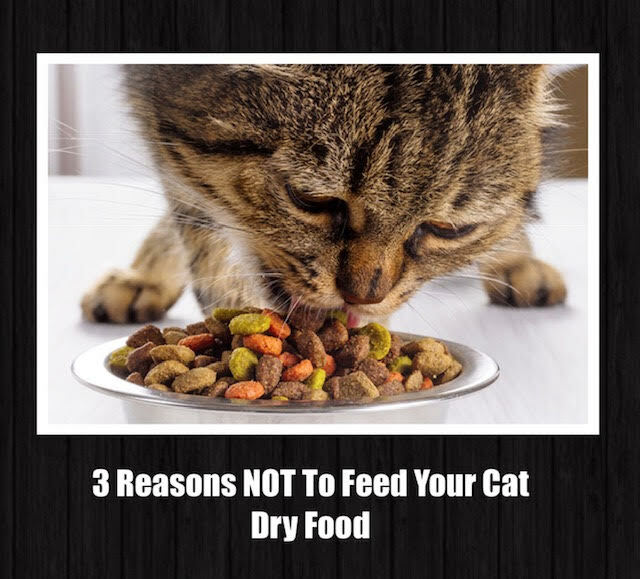 Consuming dry foods frequently contributes to obesity in cats, especially if cats are free-fed. Feeding a high-moisture, high-protein diet, low carbohydrate diet such as a raw frozen or canned food diet can help your cat maintain a healthy weight. 3. Too Many Carbohydrates - Dry kibble requires starchy carbohydrates to be used in the manufacturing process. Examples of carbohydrates in cat food include brown rice, potatoes, tapioca, wheat gluten or other grains in the manufacturing process. The starchy carbohydrates in dry kibble are hard to digest and the added sugar weakens immunity. Many cats with IBD have been fed dry kibble that not only contains unnecessary starchy carbohydrates but other fillers and chemicals. As an alternative to kibble, freeze dried raw diets can be used (mixed with water and/or canned food) because they are not made with starchy carbohydrates. Click here to learn more about pet nutrition and holistic care for your pet.